A Better Man showcases a very confident sound for Wetwood Smokes, opening into a distinct and unique vocal-heavy section. The act is able to work well in an alternative or pop-rock format. The sheer authority that the band creates during this track will ensure that listeners become fans. Madeline immediately succeeds with a fun challenge to traditional time-signatures. 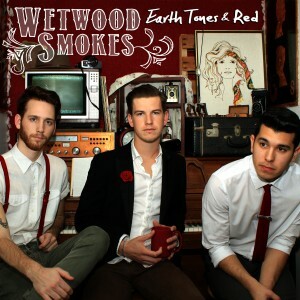 The funkiness of the composition here showcases a softer side of the band, while the dynamic created between the vocals and the drums represents the more musically complex side of the Wetwood Smokes. Cold is a track that similarly opens up the band’s palette with a contemplative and electronically-infused style. The Boy With the Glass Eye is a glorious track that is utterly expansive and full of energy, providing listeners with enough of a boost to keep them focused in on the rest of the title. The vocal / drum dynamic is continued here, adding considerably to the cohesion achieved with this album. I Am the One is a deliberate track that has the band create an atmospheric composition before turning on a dime and creating something that fans of nineties and oughts alt-rock (Radiohead, Modest Mouse, Travis) will eagerly devour. The band is able to make a cogent album from the beginning of Earth Tones and Red to the end, while imbuing each of the cuts with an expansive sound destined for radio rotation. The Earth Tones and Red album can be purchased beginning on June 10th; make sure to visit the band’s Facebook and own domain for further information about Earth Tones and Red and any further live dates to follow.